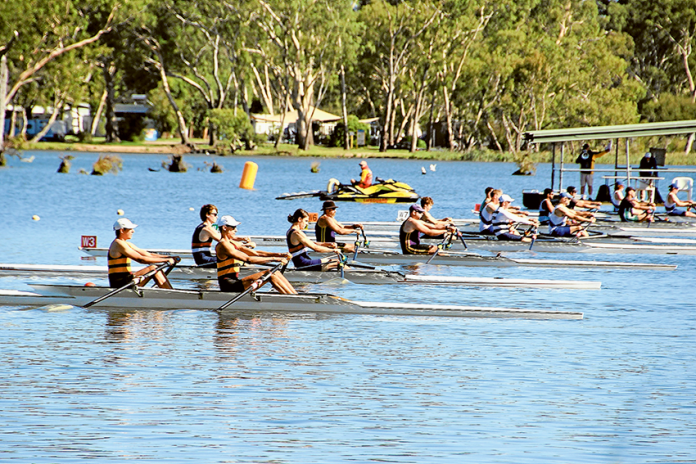 TOUGH COMPETITION… The Nagambie Rowing Regatta was a big success at the weekend, with a strong crowd of 2,500 attending to watch 1,500 athletes battle it out on Lake Nagambie. Photo: Supplied. ALMOST 1,500 athletes from clubs in Victoria and NSW took to Lake Nagambie over the weekend to battle it out on the water as part of this year’s Nagambie Rowing Regatta. Over two big days, participants competed in 132 events in front of a 2,500 strong crowd, with Nagambie Rowing Club placing fifth in the final of race 40, fourth in the final of race 133, fourth in heat two of race 119, second in heat two of race 154 and sixth in the final of race 175. Nagambie’s fastest time was achieved by the Female D Grade Coxed Quad Scull who finished race 175 with a time of 4:07.05. Shepparton Rowing Club placing fourth in the final of race 130, fourth in heat three of race 117, first in heat two of race 116, second in the final of race 131, second in heat two of race 150, third in the final of race 164, second in the final of race 165, fourth in the final of race 166, first in the final of race 167, fourth in heat two of race 152, first in heat two of race 157 and sixth in the final of race 179. Shepparton’s fastest time was achieved by the Male D Grade Coxed Quad Scull who finished race 157 with a time of 3:36.60.